With a quick jig, these fun fishing-pole roasters flip your campfire fare for even toasting. We once toasted a marshmallow THIS BIG. 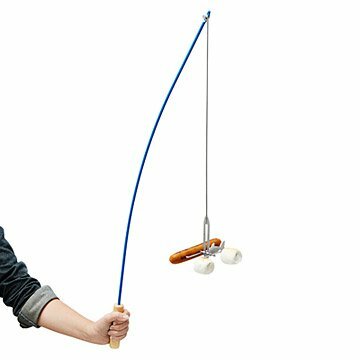 Hook and roast your favorite campfire food with this fishing pole–inspired skewer. Made of powder-coated steel and finished with a maple handle, this flipping-fun roaster will occupy a prime spot in your camp tackle box. Find a comfy spot in front of the fire, then jig the pole to flip your snack so it's evenly roasted on all sides. Made in Taiwan. Fishing Pole Campfire Roaster: 34" L x 3.25" W; 0.7 lbs. Just received for Christmas and it's not time of year to use this yet. It's fun to use and actually works! Very fun item to have! Purchased as a Christmas gift for my Nephew...Will have to wait until summer to try it out! Fun and unusual. And it looks well made. Huge hit at the gift swap! We have a fire pit at the family cabin and often roast hot dogs and marshmallows... this will be the 'stick' that the kids fight over! I'm very impressed with the quality - made to last! I'm sure my nephew and his friends will enjoy using them. Great idea! Gave 4 stars only because I haven't been able to see in action yet- giving as a Christmas gift and will hopefully be able to use in spring! This was a lot heavier duty and better constructed than I thought. Haven't actually used them yet, but I'm sure they'll be enjoyed the next time we have a fire outside. They really do "jig" like the package says. Can't wait to give them at Christmas. My son brings out the fishing pole campfire roasters along with hot dogs and marshmallows when he entertains family and friends. In addition to working well, they are a fun addition to his backyard firepit. This gift made me "supermom" on his birthday.